Slade Wilson is a complicated man. His entire life is defined by death and anger, thanks to his profession as an assassin for hire. If there’s any legacy to his name, it’s in both his biological son Joe, and surrogate son Oliver. How each son lived up to that legacy, is very different, to say the least. Joe may be a lot of things, but at the very least, he made an active attempt to reconnect with his ultimately terrible dad; Oliver just jabbed an arrow in his eye and stuck him in a prison on the same island where he got partially blown up. He’s always angry, even when he’s trying so very hard not to be, as last week’s episode shows us. The first two seasons were thought to be origin stories for Deathstroke via flashbacks, but “Promises Kept” marks the end to that tale. We finally learn how Slade got his groove back, and as always, it ultimately comes down to his hallucinations of Shado. While Joe did his best years ago to help his dad get back up to fighting shape, the trauma of losing his eye and the Mirakuru left him still functioning, but also with memory flashes leading to outbursts of anger. After years of seeing Slade at the top of his game, even pre-Mirakuru, it’s an interesting turn to watch him fall apart, and into the monster that he eventually becomes. Shado’s taunts are even more cutting than they usually are, in part because Slade had already promised Joe back then that he would never leave, and also that it’s only because of her that he learns Oliver is alive in the first place. The moment he sees the news report declaring Oliver alive is when he truly becomes alive again, taking the ASIS armor that would later become his and slaughtering everyone who gets in his way. What’s most interesting about the flashbacks of Slade is comparing them to how he is now. Oliver’s benching to being a supporting character again works to the season’s benefit here, allowing for some introspection into how his presence changed Slade. Had the Shado hallucinations not showed up when they had, he could’ve reconnected with Joe in full, and he knows that. At the same time, Oliver is also the reason Slade can really think straight and realize how badly he messed up in life. This is why the fight between father and son works as well as it does — all Joe can see is his dad as Deathstroke the Terminator and not Slade Wilson. It’s an engaging A-story this week, one with complicated family dynamics that bring the current Deathstroke solo comic to mind. It’s doubtful that this will be the last we see of Joe, and I’m hoping that he’ll return sooner rather than later. But given how Slade’s departure is handled at the end, it may be the latter, especially considering that Manu Bennett is currently working on The Shannara Chronicles. It also doesn’t help that it ends on a note that almost renders Diggle’s entire plotline up to this point sort of needless. There’s a lot of build up about Diggle’s desperation to keep his drugs secret while also finishing the mission to completion, which is good. Diggle also comes clean about everything to both the team and to Lyla, which is also good. But then, once Diggle confesses his sins to the team, Curtis points out that Diggle could’ve just gone to the tech experts of the team for a fix. It’s supposed to show that Diggle was never alone in his struggles, but instead makes him come off sort of dumb more than anything else. Still, this is a pretty good episode of Arrow, even with that strange resolution to its side story. Slade has been at the center of some of the series’ most engaging episodes, and that certainly holds true again this week. 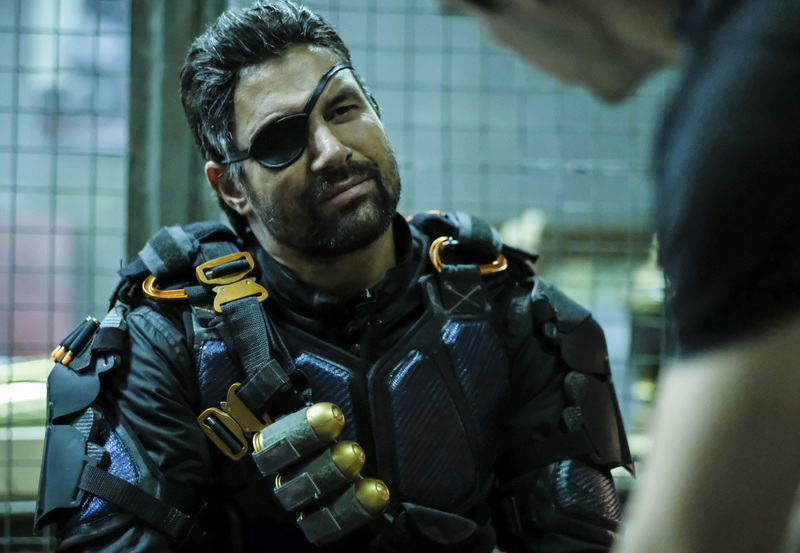 If this is indeed the last time we see Slade Wilson — and it may be, since he’s got a solo movie in the works, and WB is weird with matters such as these — this is a pretty good send-off for our favorite one-eyed assassin. Slade learns that he has a second son that Joe kept from him: Grant, who later shows up in the Arrowverse as Ravager on Legends of Tomorrow. Like I said, it wouldn’t surprise me if Grant also showed up later on if Slade’s still able to be used. I can’t overstate this enough: the Deathstroke Rebirth solo series by Christopher Priest and a variety of artists is well worth a read, and the first dozen or so issues have been collected in three volumes.